The actors retell the story of their journeys to Europe. 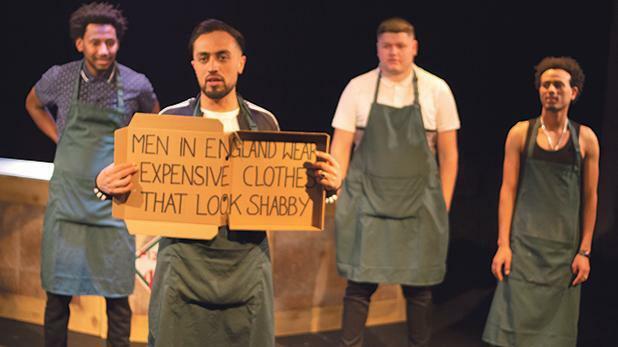 A London-based company starring refugee actors has been forced to cancel performances in Malta after one of its members was refused entry by Maltese immigration officials. Phosphoros Theatre actors were invited to Malta by the President’s Foundation of Wellbeing for Society, to perform the autobiographical play Pizza Shop Heroes. But those plans were thrown into disarray after the travel certificate presented by one of the actors, an Afghani asylum seeker, was not accepted by Malta Immigration. In a statement, the President’s Foundation said that the asylum seeker had failed to apply for a travel visa. The travel certificate presented is not accepted by Malta Immigration as a valid Schengen document for entry into Malta, the Foundation said. “It is with a heavy heart that we have to announce that the shows have to be cancelled but Malta’s laws must be respected,” a spokesperson for the President’s Foundation for the Wellbeing of Society said. The theatre company’s director, Dawn Harrison, insisted the travel certificate presented was valid for travel. “Three of the young men have refugee travel documents and one has a certificate of travel, all issued by the UK Home Office,” she told Times of Malta. “Air Malta first denied them boarding saying they needed a visa, but then backtracked the next day and said the issue concerned the certificate of travel”. Immigration’s refusal to allow the performers into Malta is especially ironic given the subject matter of Pizza Shop Heroes, which features asylum seekers discussing their difficult journeys to make it to Europe. Two performances scheduled for Thursday at Spazju Kreattiv had sold out and the troupe was expected to raise awareness about the plight of unaccompanied children fleeing persecution. Data shows that over 30,000 such children went missing between 2014 and 2017. One of the actors, Haleem Najibi, had noted the significance of their Malta performances in an article published in the Times of Malta. “It’s really significant for us to go back to mainland Europe because this time we will be travelling across the borders with legal paperwork in hand,” he said, before immigration troubles put paid to those hopes. Ms Harrison expressed dismay at the way things had worked out. “It’s ironic and devastating,” she said. “The boys are broken. They would have loved it. We were invited as guests and we have been turned away,” she said.